This model was built near to scale based on actual general dimensions and is fully textured. 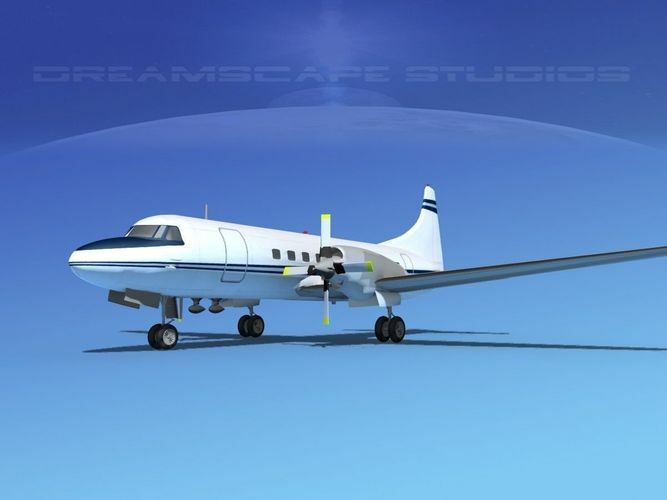 The propellers, ailerons, flaps, elevators, landing gear and landing gear doors are animateable. The model is available in several formats. The Convair CV-580 was a very popular transport aircraft for the medium haul medium load commercial airlines in the 1960s and 1970s. It was active with major and regional airlines until the late 1970s and early 1980s when they were replaced by jets, usually DC-9 and 737s. Built for smaller regional carriers and replacements for the CV-340 and Martin 404, it was essentially a CV-340 with Allison Turboprop engines providing more power, speed and efficiency. The aircraft was used by many smaller carriers for freight and charter operations well into the 2000s. Most are out of service now but some are still in service around the world.